Absurd though it may seem, I think that was the happiest time of her life. She was fighting for something; she felt alive and capable of responding to the challenges facing her. No one can judge. Each person knows the extent of their own suffering or the total absence of meaning in their lives. Two or three years later, another woman will appear in his life. I’ll find out – because I saw them or because someone told me – but this time I’ll pretend I don’t know. I used up all my energy fighting against that other lover; I’ve no energy left; it’s best to accept life as it really is and not as I imagined it to be. My mother was right. Noticed that a lot of people she knew would talk about the horrors in other people’s lives as if they were genuinely trying to help them, but the truth was that they took pleasure in the suffering of others, because that made them believe they were happy and that life had been generous with them. I want to continue being crazy, living my life the way I dream it, and not the way other people want it to be. She was confused, tensed, irritated with herself. She had never allowed herself to be provoked; she had learned early that whenever a new situation presented itself, you had to remain cool and and distant. If I had a choice, if I had understood earlier that the reason my days were all the same was because I wanted them like that, perhaps… there’s no perhaps, because there is no choice. What makes a person hate themselves? Cowardice, perhaps. Or the eternal fear of being wrong, of not doing what others expect. A few moments ago I was happy, I forgot I was under sentence of death; then, when I remembered the situation I’m in, I felt frightened. Because there is always a gap between intention and action, and she wanted to feel free to turn back halfway. You have passed through the two hardest tests on the spiritual road: the patience to wait for the right moment and the courage not to be disappointed with what you encounter. It is you I will teach. You have two choices: to control your mind or to let your mind control you. Don’t confuse insanity with a loss of control. Certain people, in their eagerness to construct a world no external threat can penetrate, build exaggeratedly high defenses against the outside world, against new people, new places, different experiences, and leave their inner world stripped bare. It is there that bitterness begins its irrevocable work. She had always spent her life waiting for something. She is not going to stop something which gives her pleasure just to be nice to a complete stranger. If she should react badly, you’ll never have another chance to approach her. Veronika assumed an ironic air, smiled, turned and moved off so that no one would notice that her eyes were filling with tears. She had never allowed herself to be provoked. She needed to get back to the person she used to be, someone able to respond with irony, to pretend that insults didn’t bother her because she was better than all of them. A person like everyone else in the world needed other people in order to be happy. Veronika had always hated goodbyes. Stay mad, but behave like normal people. Run the risk of being different, but learn to do so without attracting attention. Don’t be embarrassed about being loved. I am not asking you for anything. A fictional novel of temptation. I discovered that confronted by temptation, we will always fall. Given the right circumstances, every human being on this earth would be willing to commit evil. There were two things that prevent us from achieving our dreams: believing them to be impossible or seeing those dreams made possible by some sudden turn of the wheel of fortune, when you least expected it. All our fears suddenly surface: the fear of setting off along a road heading who knows where, the fear of a life full of new challenges, the fear of losing forever everything that is familiar. She was convinced that the stranger must now be tired of her silence and that shortly – perhaps that very afternoon – he would decide to choose someone else. But she was too cowardly to change her fate. So you see, Good and Evil have the same face; it all depends on when they cross the path of each individual human being. I spend the whole day looking at nature. Some people think it’s a waste of time, but it was the only way I could find to accept the loss of someone I loved very much. I’ve just taught you the most important lesson in life, whenever you want to achieve something, keep your eyes open, concentrate and make sure you know exactly what it is you want. No one can hit their target with their eyes closed. In order to struggle with yourself, you needed to get to know me better. I am a man who walks the earth with a devil at his side; in order to drive him away or to accept him once and for all, I need to know the answers to certain questions. There was terror in each and every one of the people. Terror of being alone, terror of the darkness filling their imaginations with devils, terror of doing anything not in the manuals of good behavior, terror of God’s judgment, of what other people would say, terror of loving and being rejected. Terror of going somewhere new, of not being able to speak a foreign language, of not making the right impression, of growing old, of dying. Whenever you want to achieve something, keep your eyes open, concentrate and make sure you know exactly what it is you want. No one can hit their target with their eyes closed. In the first place, you shouldn’t believe in promises. The world is full of them: the promises of riches, of eternal salvation, of infinite love. Some people think they can promise anything, others accept whatever seems to guarantee better days ahead, as, I suspect is your case. Those who make promises they don’t keep end up powerless and frustrated, and exactly the fate awaits those who believe promises. People want to change everything and, at the same time, want it all to remain the same. Her heart had already been broken many times over, and yet she still believed she was destined to meet the man of her life. It was all a matter of control. And Choice. Anyone who loves in the expectation of being loved in return is wasting their time. Everyone had their own theory about everything, and they believed that their truth was the only one that mattered. They spent days, nights, weeks and years talking, never accepting the fact that good or bad, an idea only exists when someone tries to put it into practice. A fictional novel about love and loss, about taking risk and acceptance. If only I could tear out my heart and hurl it into the current, then my pain and longing would be over, and I could finally forget. May my tears run just as far, that my love might never know that one day I cried for him. I shall forget the roads, the mountains, and the fields of my dreams — the dreams that will never come true. I remember my “magic moment” — that instant when a “yes” or a “no” can change one’s life forever. It seems so long ago now. It is hard to believe that it was only last week that I had found my love once again, and lost him. All love stories are the same. We will only understand the miracle of life fully when we allow the unexpected to happen. Yes, we are going to suffer, we will have difficult times, and we will experience many disappointments — but all of this is transitory; it leaves no permanent mark. And one day we will look back with pride and faith at the journey we have taken. Pitiful is the person who is afraid of taking risks. What have you done with the miracles that God planted in your days? What have you done with the talents God bestowed on you? You buried yourself in a cave because you were fearful of losing those talents. So this is your heritage: the certainty that you wasted your life. At any given moment in our lives, there are certain things that could have happened but didn’t. The magic moments go unrecognized, and then suddenly, the hand of destiny changes everything. Yes, life teaches us many things, it taught me that we can learn, and it taught me that we can change, even when it seems impossible. No one can lie, no one can hide anything, when he looks directly into someone’s eyes. And any woman with the least bit of sensitivity can read the eyes of a man in love. It wasn’t what I had been thinking; he was no longer insisting, he was ready to let me leave — a man in love doesn’t act that way. We recognize that the magic moment of the day has passed and that we’ve done nothing about it. We have to listen to the child we once were.We can stifle its cries, but we cannot silence its voice. We have to allow it to feel loved again. I was more and more convinced that he was right: there are moments when you have to take risk, to do crazy things. It is all a dream. It’s going to end. But how long can I make the dream go on? Lovers need to know how to lose themselves and then how to find themselves again. It must have been the lunatics who invented love. Love is much like a dam: if you allow a tiny crack to form through which only a trickle of water can pass, that trickle will quickly bring down the whole structure, and soon no one will be able to control the force of the current. For when those walls come down, then love takes over, and it no longer matters what is possible or impossible; it doesn’t even matter whether we can keep the loved on at our side. To love is to lose control. Love is a trap. When it appears, we see only its light, not its shadows. I knew it, I said to myself. I knew he was going to turn my world upside down. My brain warned me, but my heart didn’t want to take its advice. Life takes us by surprise and orders us to move toward the unknown — even when we don’t want to and when we think we don’t need to. I am just like everyone else who listens to their heart: a person who is enchanted by the mystery of life. Who is open to miracles, who experiences joy and enthusiasm for what they do. It’s just that the Other, afraid of disappointment, kept me from taking action. It’s risky, falling in love. I’ve been hurt before. It’s like a narcotic. At first it brings the euphoria of complete surrender. The next day, you want more. You’re not addicted yet, but you like the sensation, and you think you can still control things. You think about the person you love for two minutes, and forget them for three hours. But then you get used to that person, and you begin to be completely dependent on them. Now you think about him for three hours and forget him for two minutes. If he’s not there, you feel like an addict who can’t get a fix. And just as addicts steal and humiliate themselves to get what they need, you’re willing to do anything for love. For years, I had fought against my heart, because I was afraid of sadness, suffering and abandonment. But now I knew that true love was above all that and that it would be better to die than to fail to love. Even if loving meant leaving, or solitude, or sorrow, love was worth every penny of its price. Yes, break the glass. A simple gesture, but one that brings up fears we can’t really understand. What’s wrong with breaking an inexpensive glass, when everyone has done so unintentionally at some time in their life? It’s a rite of passage, I wanted to say. It’s something prohibited. Glasses are not purposely broken. Our universe requires that we avoid letting glasses fall to the floor. But when we break them by accident, we realize that it’s not very serious. Breaking glasses is part of life and does no damage to us. Break the glass. Try to understand that I have broken things within myself that were much more important than a glass, and I’m happy I did. Resolve your own internal battle, and break the glass. Break the glass, please — and free us from all these damned rules, from needing to find an explanation for everything, from doing only what others approve of. This was the kiss I had waited for so long — a kiss born by the rivers of our childhood, when we didn’t yet know what love meant. A kiss that had been suspended in the air as we grew, that had traveled the world in the souvenir of a medal, and that had remained hidden behind the piles of books. A kiss that had been lost so many times and now was found. In the moment of that kiss were years of searching, disillusionment, and impossible dreams. My heart leaped, but I didn’t want to believe it. I felt free again, ready to return to the world and be a part of it once again. The worst had passed, although the sadness remained. A friend asked me once if I am happy. As I try to be perfectly honest with her I know she wouldn’t understand. I know we differ and that no word can fully explain the deeper meaning of happiness for someone like me. It’s always like this, the more I compel people to understand, the more I sounded like a defensive criminal as I myself is also in doubt. And so I let go. In fact I’ve asked myself this question a million times before. Am I really happy or just plainly comfortable with life as it is? Happiness is the same as any other feelings. It comes and goes. One moment you are sad and then a circumstance comes up and you suddenly feel excited and then it fades. It is part of the daily flow of life. Happiness for me is the balance of contentment and letting go. Contentment of what has been will be part of my past and that, it will shape who I will become and that letting go is for the hurt and pain that comes along with the memory. As we go through the different journeys of our life, there are standards we set for ourselves in order to determine our happiness. It does not mean if you aren’t with someone at 40, you are not happy. It is just a norm that we grew up to know. Our basis for true happiness depends on whether we have someone to lean on (meaning we are dependent on someone). How about thinking the other way, true happiness can also mean giving back to others who needs our care and love the most (well, other than our families). Inspiration came from this book – “The Giving Way to Happiness” by Jenny Santi. Going scientific here, according to her it is proven that giving or helping others releases the same healthy “do-good” chemicals as when we feel when we are romantically involved with someone. It is what my heart tells me, but unconsciously, it is not what I want people to see. I know I am happy but it is so difficult to interpret. I try to list down the reasons why but I am in no way near everyone’s expectation of happiness. So, am I? I’m going back, or, rather, part of me is going back to that world where only what we can see, touch, and explain makes sense. This is the universe I’ll have to live with for the rest of my days. I also know that, at night, another part of me will remain wandering in space, I’ll place an open pair of scissors on my bedside table to snip off the end of the dream. The next day, I’ll look at the scissors with a touch of regret, but I must adapt to living in the world again or risk going mad. Everyone’s looking for the perfect teacher, but although their teachings might be divine, teachers are all too human, and that’s something people find hard to accept. Don’t confuse the teacher with the lesson, the ritual with the ecstasy, the transmitter of the symbol with the symbol itself. But we are weak: we ask the Mother to send us guides, and all she sends are signs to the road we need to follow. Athena brought to the surface the immensely rich world we all carry in our souls, without realizing that people aren’t yet ready to accept their own powers. We women, when we’re searching for a meaning to our lives or for the path of knowledge, always identify with one of four classic archetypes. The Virgin is the one whose search springs from her complete independence, and everything she learns is the fruit of her ability to face challenges alone. The Martyr finds her way to self-knowledge through pain, surrender and suffering. The Saints finds her true reason for living in unconditional love and in her ability to give without asking anything in return. Finally, the Witch justifies her existence by going in search of complete and limitless pleasure. Normally, a woman has to choose from one of these. Life, however, had other plans — when fate is very generous with us, there is always a well into which all our dreams can tumble. A life I had chosen in the belief that love conquers all. And it isn’t true. Sometimes love carries us into the abyss, taking with us — to make matters worse — the people we love. When the pain abated — time is the only cure for that — I saw that life had allowed me to meet the one woman I would ever be capable of loving. Each second spent by her side had been worthwhile, and given the chance, despite all that had happened, I would do the same thing over again. “Because all my life I’ve learned to suffer in silence,” she replies. And only then did she put her arms around me and cry out all the tears she would like to have shed on that day. Like all storms, it brings destruction, but at the same time, it soaks the fields, and the wisdom of the heavens falls with the rain. Like all storms, it will pass. The more violent it is, the more quickly it will pass. What would tomorrow bring me, along with the departure of the being I’ve always both loved and feared from a distance? I was everyone, and everyone was me and my solitude. They’ll get lost, and that’s the best way to discover interesting places. Forget everything you’ve ever learned about the stars and they’ll once more be transformed into angels, or into children, or into whatever you want to believe at that moment. Try to feel good about yourself even when you feel like the least worthy of creatures. Reject all those negative thoughts and let the Mother take possession of your body and soul. Everything is worship if your mind is focused on the present moment. Don’t try to convince anyone of anything. When you don’t know something, ask or go away and find out. Simply believe that you can. At first, you’ll be confused and insecure. You have the knowledge, it’s simply a matter of being aware. Be clear. Reprogram yourself every minute of each day with thoughts that make you grow. When you’re feeling irritated or confused, try to laugh at yourself. Laugh out loud. Concentrate. If you can find nothing on which to focus your mind, concentrate on your breathing. Listen to your heart beating, follow the thoughts you can’t control, control your desire to get up at once and to do something “useful”. Sit for a few minutes each day doing nothing, getting as much as you can out of that time. When you’re washing up, pray. Be thankful that there are plates to be washed; that means there was food, that you fed someone. You are what you believe yourself to be. Don’t be like those people who believe in “positive thinking” and tell themselves that they’re loved and strong and capable. You don’t need to do that, because you know it already. And when you doubt it — which happens, do as I suggested. Instead of trying to prove that you’re better than you think, just laugh. Laugh at your worries and insecurities. View your anxieties with humor. It will be difficult at first, but you’ll gradually get used to it. NB! Every word from this post came from Paulo Coelho’s book. 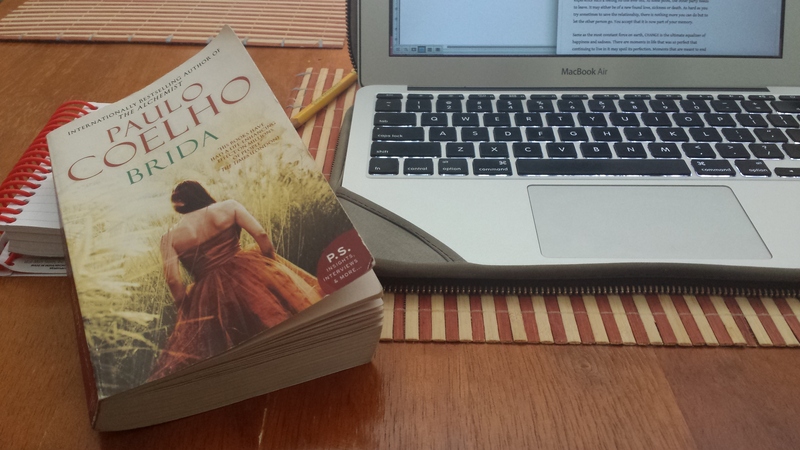 Among the books of Paulo Coelho, I find Brida to be the closest to my heart although I love all the others. It relates to me as if I am Brida and my husband is the Magus. In the book, Brida came to the Magus in search of a teacher to learn about the Tradition of the Sun and turned out found her soul mate. The Magus, on the other hand, is a fully knowledgeable teacher who at the first sight of Brida knew instantly that she is his soul mate, his true love. I love how the author described in detail the process of meeting your soulmate. Just like in the book, I met my husband not knowing that all along, upon seeing me the first time, he knew from his heart I will be his wife. For me, it was definitely not love at first sight. As I feel that I still have a lot to do with my life (and for a young person on her twenties), there are definitely a lot of opportunities ahead of me that if I miss out, I might regret. In choosing our path, it is normal to miss out on the other. I was thinking of my husband when he affirmed to it. He said to me one day that he understand that I still have a lot to do, like figuring out what I want to do in life and that I am the only one to realize my path. Come to think of it now, his words are indeed so helpful to me. Well, knowing that he is not physically around me anymore, his words echoes through my life, these are the words that somehow help me get through my darkest days. It is quite amusing that all along, as he let me realize my life, I am quite confused of the feeling every time he is around. In the book, the author describes, this is how we know who our soulmate is — “the light in their eyes”. And how would we know? By taking risks. And I did. And the rest was history. The Magus realized in the end the most important lesson, that love is liberty. During our short-lived marriage, I can say that I have experienced the love of a lifetime that even after his death, I still survive. At first I was not sure how one survive a death of your partner, but then the answer came saying that as long as his love for me is alive, it will be my oxygen to help me breathe for the rest of my life. And as for the topic about the possibility of meeting more than one soulmate in our life, the answer is I’m not really sure as I haven’t experienced meeting another one. But maybe, just maybe, when there is one (one day) the love that is keeping me alive will be renewed as I fill my soul again with more love and faith. Excerpt from the book: That’s a risk we’re going to take together, Brida. An anonymous text from the Tradition says that, in life, each person can take one of two attitudes: to build or to plant. The builders might take years over their tasks, but one day, they finish what they’re doing. Then they find they’re hemmed in by their own walls. Life loses its meaning when the building stops. “Would you give up everything for that man?” It wasn’t so much a question, it was a choice, the most difficult choice anyone would have to make in life. He looked at the girl’s eager, trusting face. In his heart, he prayed she would understand what he had to teach her. She was, after all, his soul mate, even if she didn’t yet know it, even if she was still very young and fascinated by the things and the people of this world. She had met people who had lost the glow of being alive because they could no longer fight against loneliness and had ended up becoming addicted to it. “But how will I know who my Soul Mate is?” You could tell your Soul Mate by the light in their eyes, and since time began, that has been how people have recognized their TRUE LOVE. By taking risks. By risking failure, disappointment, disillusion, but never ceasing in your search for Love. As long as you keep looking, you will triumph in the end. “Is it possible to meet more than one Soul Mate in each life?” Yes, and when that happens, the heart is divided and the result is pain and suffering. The essence of Creation is one and one alone. And that essence is called Love. Love is the force that brings us back together, in order to condense the experience dispersed in many lives and many parts of the world. Choosing a path meant having to miss out on others. She had a whole life to live, and she was always thinking that, in the future, she might regret the choices she made now. That was the wisdom of Soul Mates: they always recognized each other. True love allowed each person to follow their own path, knowing that they would never lose touch with their Soul Mate. Love do not grow old along with the body. Feelings form part of a world I don’t know, but it’s a world where there’s no time, no space, no frontiers. “For many days, I wondered if that man really existed. In the end, I decided that he had been a real man, a man who had loved me, even if only for an afternoon, and during that afternoon, he’d given me everything he had kept to himself throughout his life: his struggles, his joys, his difficulties and his dreams. That afternoon I gave myself wholly as well — I was his companion, his wife, his audience, his lover. In a matter of only few hours, I experienced the LOVE OF A LIFETIME. Love was about everything else and there was no hatred in love, only the occasional mistake. “That is what the forest taught me. That you will never be mine, and that is why I will never lose you. You were my hope during my days of loneliness, my anxiety during moments of doubt, my certainty during moments of faith. “You came to me from the slavery I myself had created, to tell me that I was free to return to the world and to the things of the world. I understood everything I needed to know, and I love you more than all the women I have ever known, more than I loved the woman who, quite unwittingly, exiled me to the forest. I will always remember now that LOVE IS LIBERTY. That was the lesson it took me so many years to learn. NB! Every word from this post came from the book by Paulo Coelho.